So, an awesome combination of things happened Sunday before last. She agreed to take lots of photos. And lots of photos were taken of lots of things! So I can finally catch up on masses of unblogged creations! I’m going to start you off with something simple. Some awesome knitting. It was really really REALLY bright. I’m avoiding looking at the sun at all costs. After finishing my Peggy Sue cardigan, I had some yarn leftover and wanted to do something simple while I mentally laboured over the planning for my next cardigan (which I’ve now just finished too!) 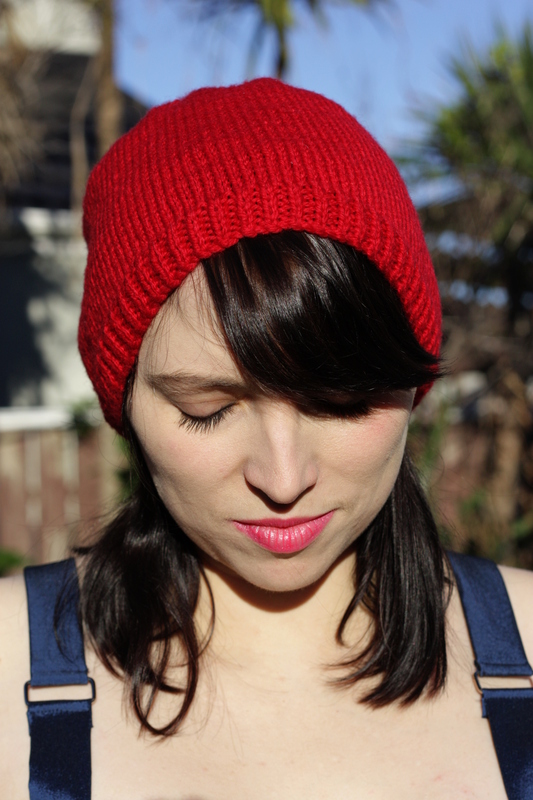 So I grabbed a simple knitted-flat-and-seamed beanie pattern and cast on. I didn’t bother swatching, just sized up the same way I had for Peggy Sue, and got into it. Arrrgh I need to trim my fringe! I did have to frog quite a bit on my first attempt as I missed the itty-bitty-but-really-important piece of text that said “knit in stocking until it measures 16cm” and so I started my shaping immediately after the rib band, resulting in something a little like a yarmulke, whoops! But after ripping back the shaping and checking the pattern, I was away. I’m not sure I was very good at measuring the 16cm though, because this has happened. Do I have short head? Can I not measure? Is it a typo? Regardless, this is not what I was expecting! I wasn’t frogging it a second time though, so I’ve decided that it’s not a beanie, it’s a slouch hat, and the extra height is perfect for going over my pony tail. Sometimes in the wind it slides down into my eyes, so I’m just going to have to wear it with a bobby pin or two to secure it at a jaunty angle. Normally my blog posts have lots and lots of words (so much so that the next post I’m drafting I’ve had to split into two) but somehow this one doesn’t warrant it. Consider it a reprieve until my next overly wordy post appears! Or maybe I'll just wear it like this! 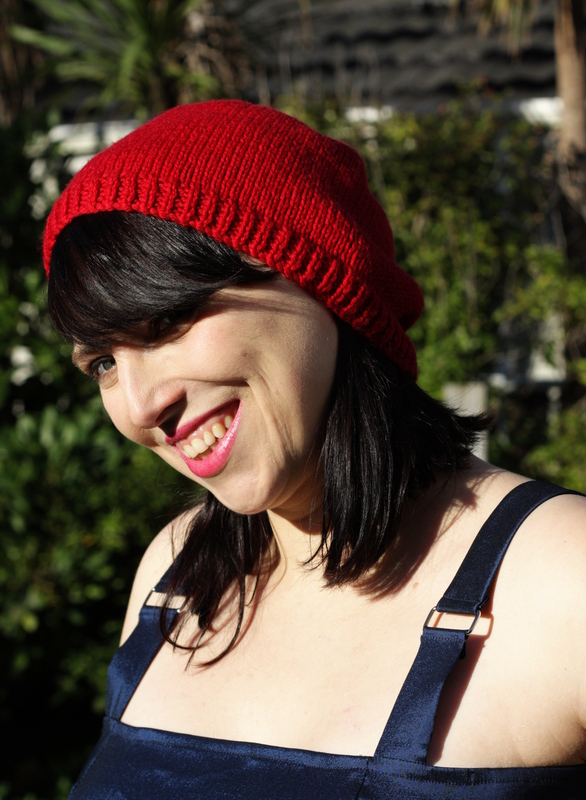 Having learned to knit in December 2011, I’d been looking for simple, quick projects to practice on. When I was at Rocking in the Hutt in February 2012 with D, a camping enthusiast, he mentioned he was looking for thick socks to wear in his tent at night. My craft-gift-opportunity alarm went off and I knew instantly that this was a prime knitting opportunity! Slippers! I spent a lot of time on Ravelry searching for the perfect pattern. The slippers had to come up to the ankle (so many slipper patterns leave the top of the foot bare, why??? 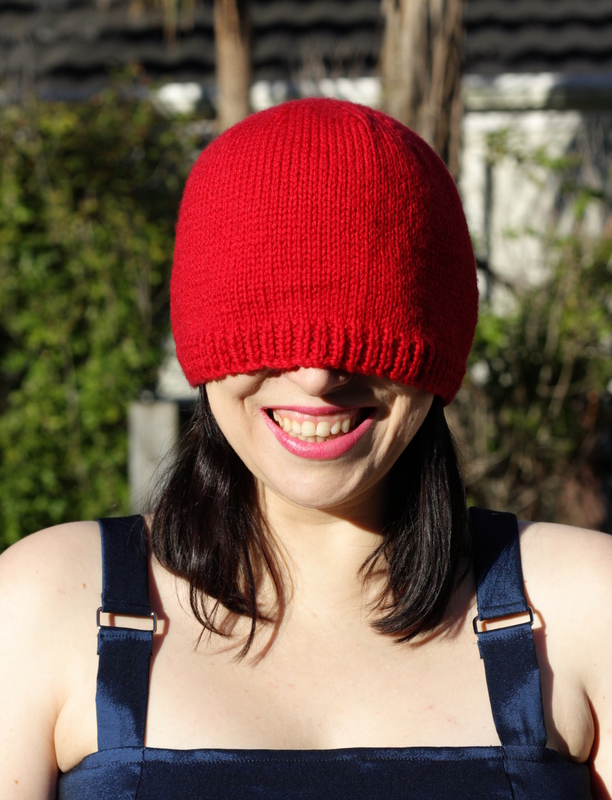 ), but it had to be free, had to be knitted in the flat, and had to be simple. This was my first make after my doll after all! 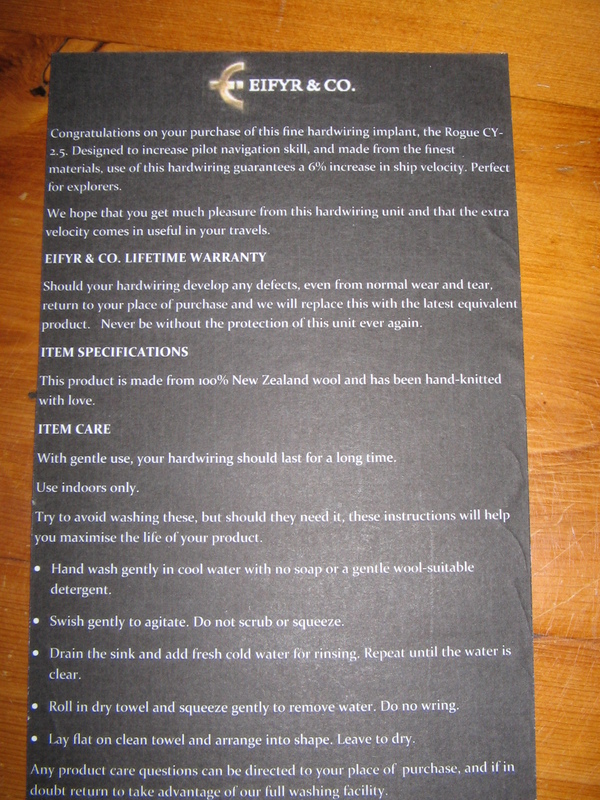 I searched, favourited, emailed to Mum for review and approval, settled on a pattern, and bought the yarn. As it was my first solo knit project, mum said she’d knit the pattern through first so that she could give me advice over the phone. So when I bought my yarn (Naturally Naturelle, 100% wool 14 ply and super thick and bouncy) I bought enough for her as well and posted it up. 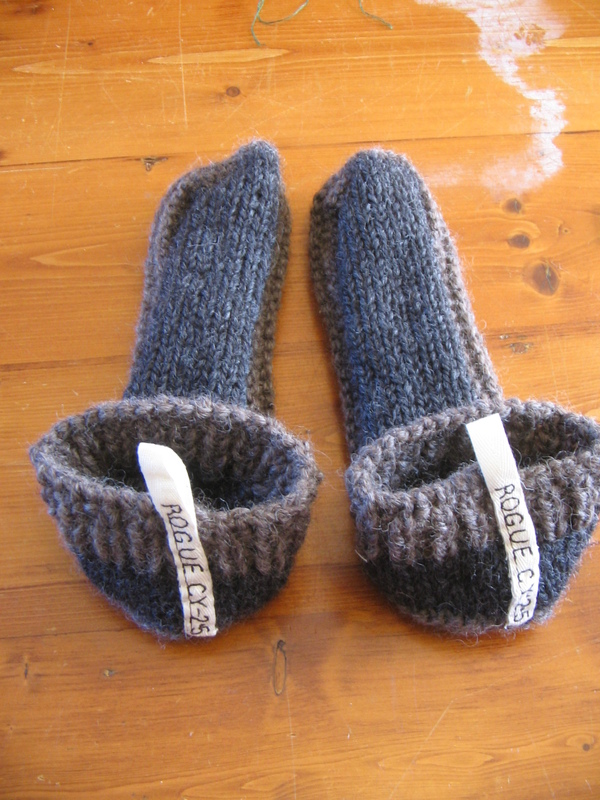 Mum knocked out the first slipper in about 2 hours, rang me up, told me about the typo and told me to go for it. 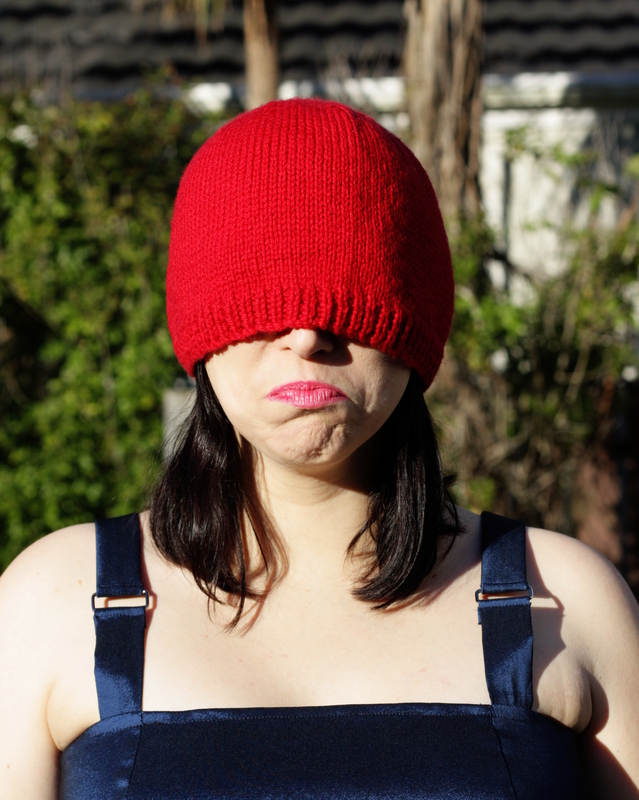 Knitting solo was tricky. Mum attempted to teach me over the phone how to make one by picking up the bar below, but I got it wrong. Luckily Google came to my rescue. I also decided to make the slippers bigger, as D has good sized feet and the pattern was for medium. So I guesstimated how much extra to cast on, tried it out, decided it was wrong, frogged it, re-guesstimated, cast on, decided it was good, made up one slipper (yes, just one), was disappointed that none of my other male friends I could easily access had the right size feet to test it out, and posted that lonely slipper up to Mum too. Her partner, SB, had the right sized feet and success! The slipper fitted! 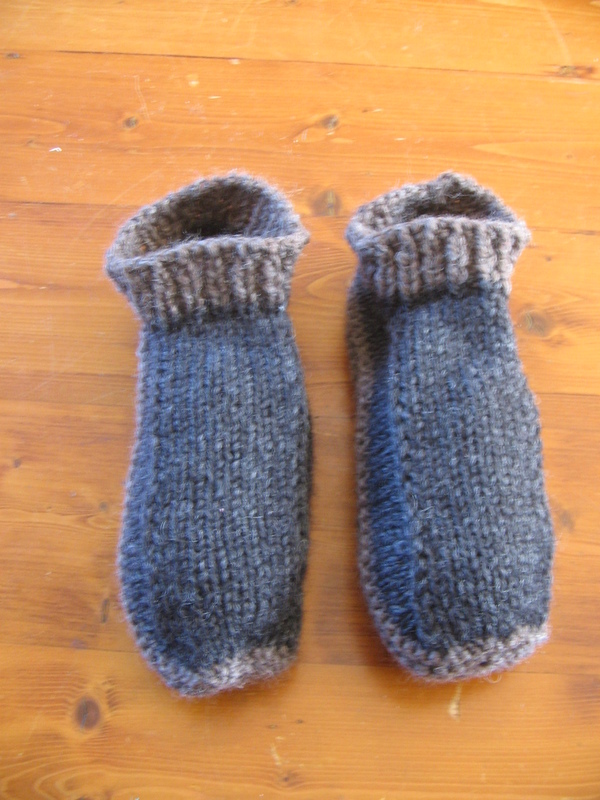 I quickly knitted up the slippers proper and really loved this pattern. 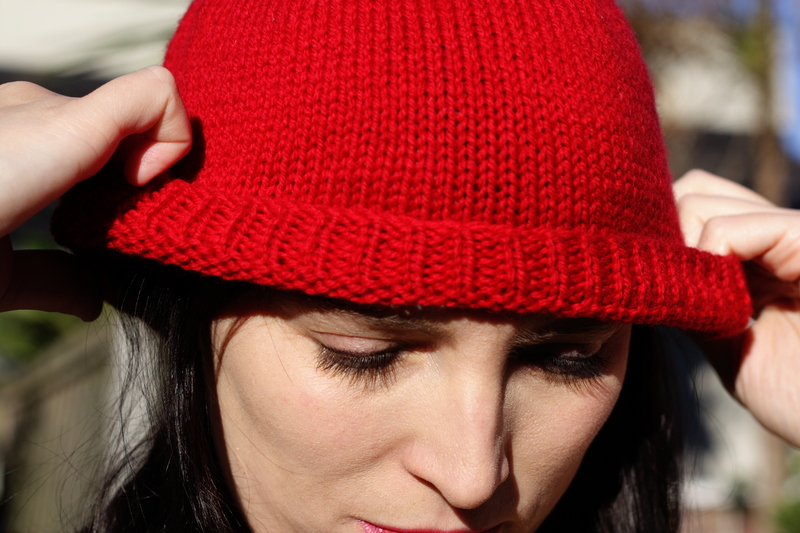 The short row shaping creates really cool ridges and makes a fantastic shape, and it is fast and easy to knit. I did make one change – the pattern calls for a garter band at the ankle, but when SB tested it he said it made it tricky to get on an off, so I replaced it with a band of rib. I took this before I added the tape but it’s the only front view I have. You can see the clever ridges up each side of the foot from the short rows. I stuffed these with tissue for this photo. 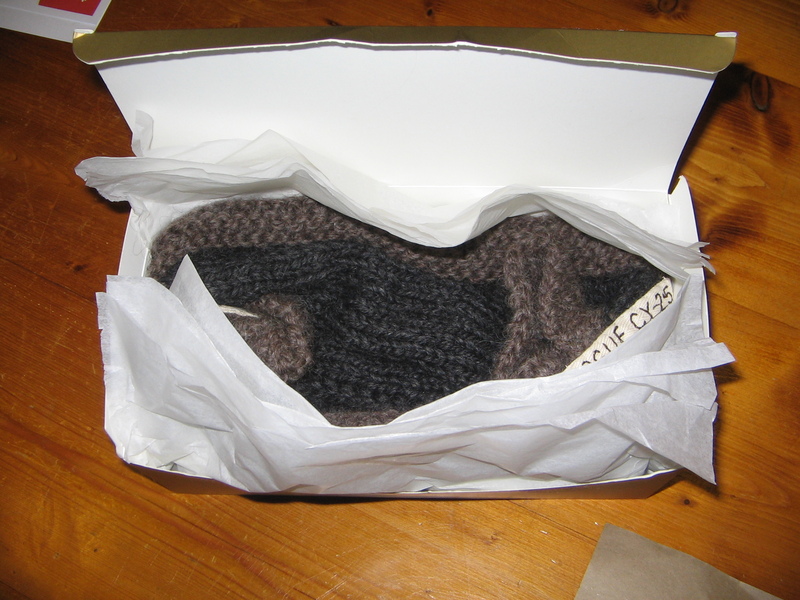 Once I’d made the slippers, I knew I wanted to make them just a little bit special, as D was about to go overseas to go tramping through Europe. He’s a big fan of the MMORPG Eve so I decided to give them “Eve cred”. I know all RPGs have equipment or apparel you can acquire in the game which gives you more points on a particular attribute, so I contacted my great friend Ares, an Eve addict, and got him to help me out. 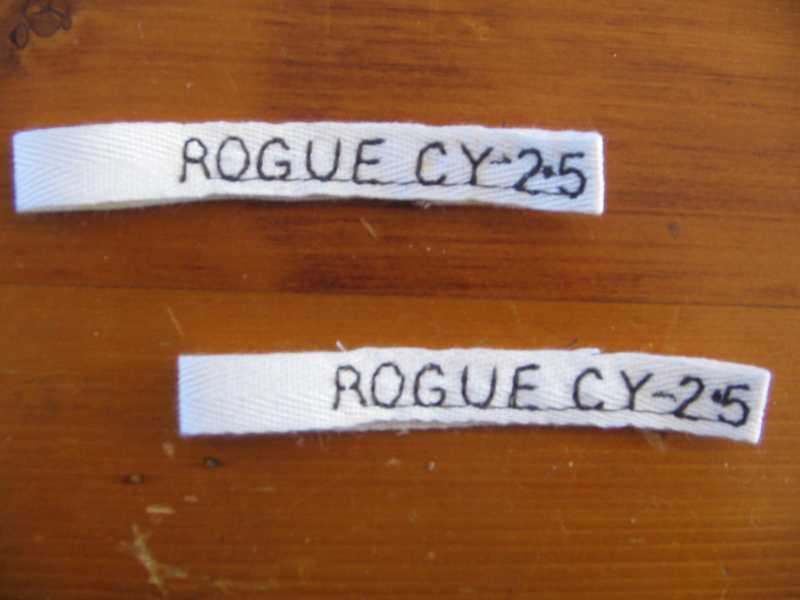 We settled on Rogue CY-2.5. This piece of equipment, in the game, increases navigation skill, which I thought was appropriate for someone travelling alone with little more than a tent, a laptop, and his wits. Another friend, The Sewhpist, used her fancy sewing machine to machine stitch the letters onto cotton twill tape, and I sewed it onto the heels of the slippers, where they double as little loops to help get the slippers on. I hand stitched the cotton tape on with silk thread. Ares also looked up D’s character and got his character’s address in the Eve world, and provided me with a logo of one of the shops in the game you can buy the equipment from, which I used to make the presentation perfect. 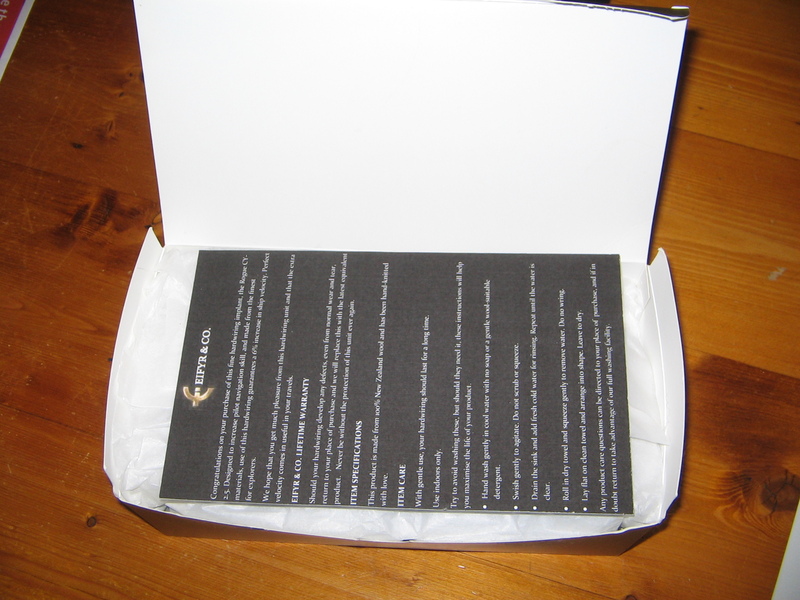 I designed a “product insert brochure” which went with the slippers, wrapped in tissue, into a box. I added an address label, a logo, and a seal to the box and it was done! Gamer geek cred slippers! …then I sealed the box by cluing the supplier logo over the opening, and added another supplier logo and his character’s address. The rubber bands were only on while the glue dried on the seal. 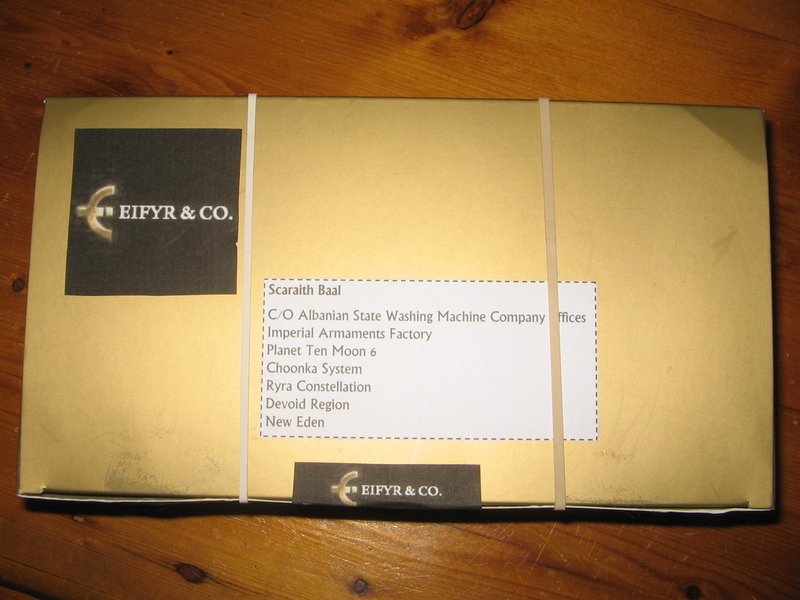 I gave them to the recipient in May 2012 and they were very well received. I’d call that a win for a knitting project! 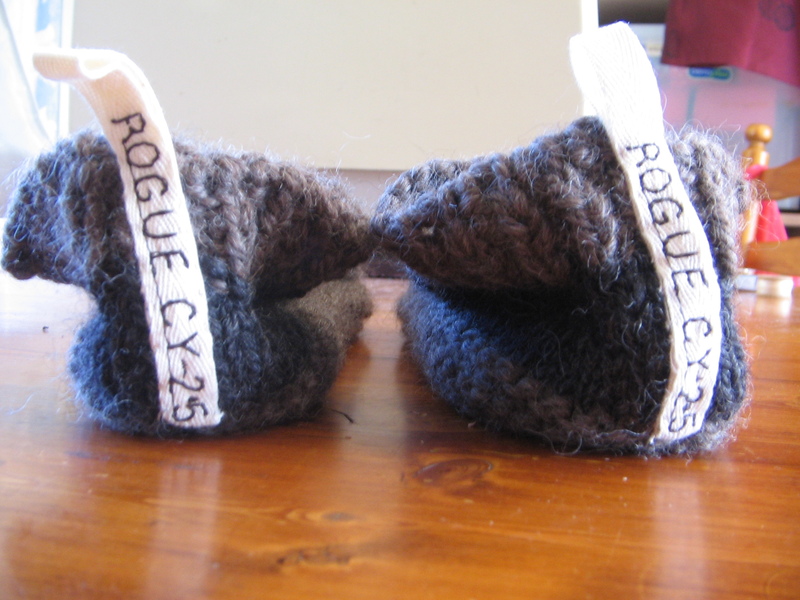 Oh and don’t worry – I eventually got around to knitting one more slipper to go up to SB to go with his test slipper. Can’t have the man having one slippered foot!